Can ebook piracy be prevented (or even just managed)? 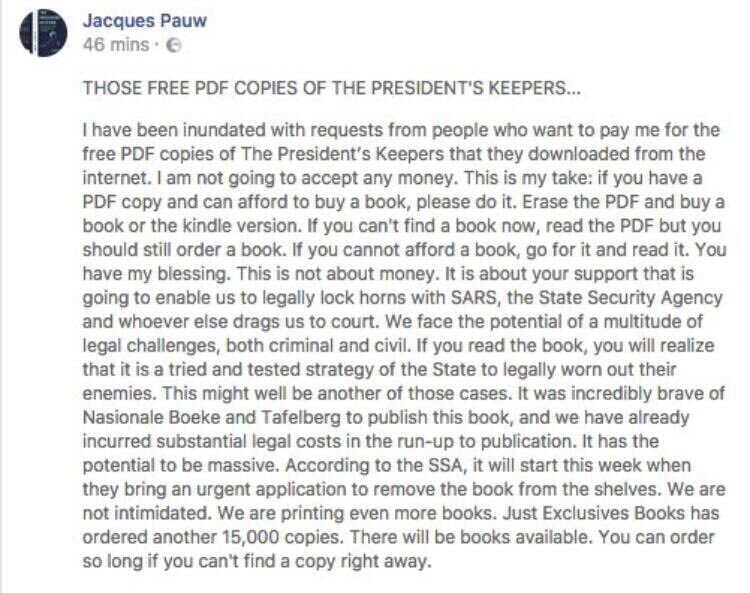 The recent blockbuster success of South African investigative journalist Jacques Pauw’s explosive new book, The President’s Keepers, has put book piracy in the spotlight again. After the State Security Agency caused a quite vivid demonstration of the Streisand Effect by demanding the book be pulled from shelves, readers jumped to get copies from bookstores – which soon ran out of stock. It was not long before an illegal electronic copy of the book began circulating online. There is no doubt that content theft harms authors, and that it harms readers too: piracy causes books never to be written, as Maggie Stiefvater explains in this story about her personal experience as an author. But surely in this age of technological wizardry, it is possible to prevent illegal copies of books? Sadly, it’s not that simple. It is always possible to make an illegal copy of a book. A book is information; no more, no less. If you can read it, you can copy it. It might be effort (e.g. retyping it manually), but it is always possible. 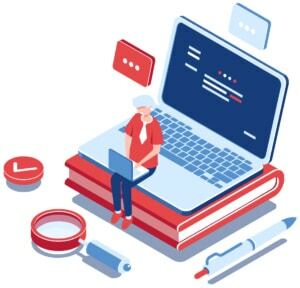 Usually, it is much easier than that: physical copies can be scanned, and optical character recognition (OCR) can quickly turn the bulky scan into a compact ebook. Ebooks themselves are already digital, and without some strong form of protection, they are trivial to copy and distribute. Of course, “I can’t get hold of the book anywhere” is hardly an excuse to pirate nowadays, as more and more publishers are releasing physical and electronic versions of books simultaneously. Pauw’s book is available on Amazon, and impatient readers can sink their teeth into a legitimate electronic copy within minutes. So where does that leave authors? Are they at the mercy of readers who may decide to purchase a book, or simply pay nothing? It has never been easier or cheaper to get the written word to the furthest corners of the world; however, it still costs just as much money, risk and sacrifice to author a book. The first approach is to make it difficult to copy a book. For physical books, it is already cumbersome to make physical copies (although it is not unusual to see photocopied textbooks on university campuses). On the other hand, digital files lend themselves to unlimited replication, and each copy is a perfect replica of the original. If you bought the ebook version of Pauw’s book, it would have been in Amazon’s proprietary Kindle File Format. Kindle ebooks are encrypted, and can only be read using the freely downloadable Kindle app on mobile devices or computers. It uses digital rights management (DRM) which means that the app will refuse to open a copy of a book that you did not buy. DRM puts an ebook under lock and key, and you can only read it if you have the key. Ebook DRM is controversial. It limits the ways in which readers can access their books. Also, there is always the chance that readers lose their libraries if a particular format or platform is discontinued, or if a reader loses access to her account. DRM has never been particularly good at keeping titles under lock and key either, and most ebook DRM formats are reasonably easy to circumvent. There is a strong argument that DRM does more bad than good. DRM basically assumes that readers cannot be trusted and that special software is needed to keep them honest. A more reader-friendly approach is to rather assume that someone who bought a book is honest and supportive of the author, and will not make illegal copies to redistribute. (As an aside, lending a book to a friend, or borrowing a book from a library – whether in paper or digital form – is not illegal distribution, but is often made difficult or impossible by DRM). Since books are precious, it has always been common practice for book owners to mark their books with their identities. 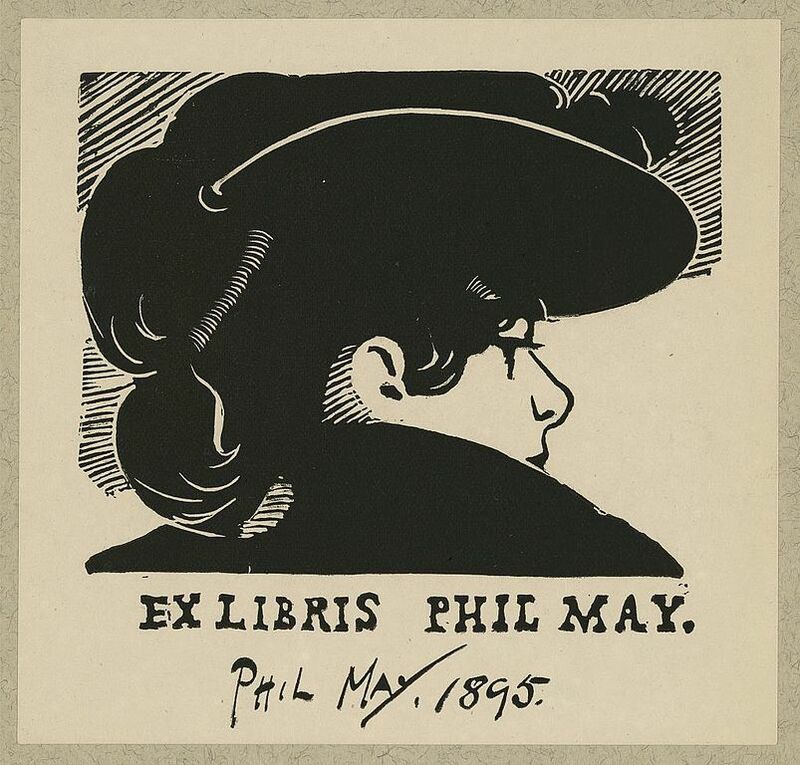 Sometimes it may just be a name scribbled on the title page; for centuries it has been popular to affix beautiful ex libris bookplates to the front endpapers of books. Having your identity in your copy of a book has always been perfectly acceptable. 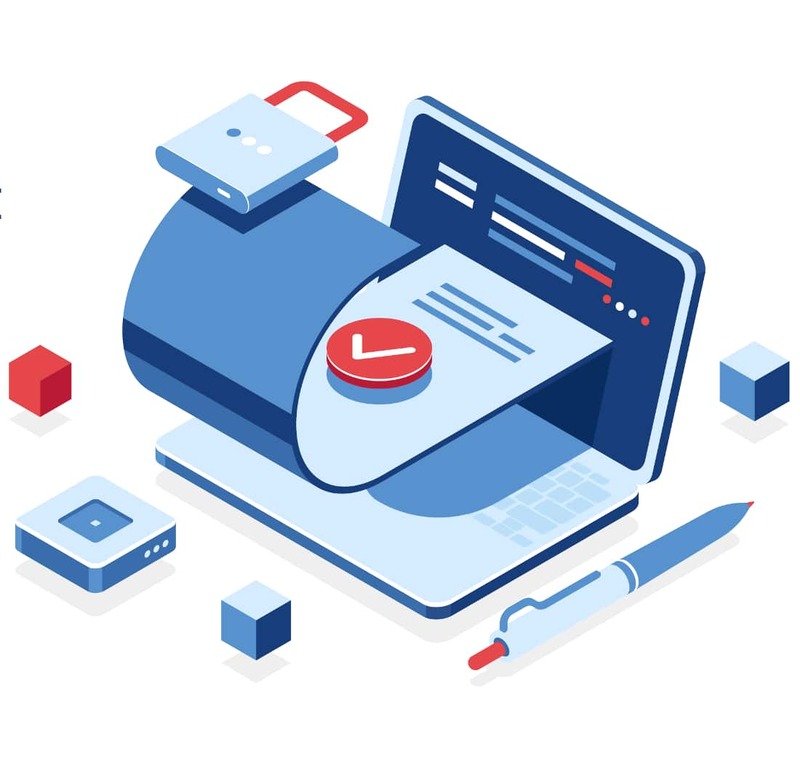 This practice is just as feasible with ebooks, and some publishers include graphical bookplates, personalised footers, or customised license pages in the copy that the reader downloads. Additionally, digital documents lend themselves to forensic watermarking – a technique where the recipient’s identity may be invisibly woven into the digital data, typography, or even the structure of the text itself. These digital watermarks are very useful in managing piracy. Recipients are far less likely to redistribute digital media if it is marked with their identity. This helps to prevent the “original infringement”, where someone decides to share their copy of an ebook with a circle of friends, or with the entire internet. Forensic watermarking is especially useful when copies are distributed prior to the publication of a book. Pauw dodged this risk well (and, by all accounts, with very careful planning and effort) by keeping his book completely off the public radar prior to its release date. However, a pre-release leak could have been damaging, since it would have been much more difficult to manage legal kickback before the book was in the public’s hands. A multitude of recipients read a book prior to its publication! Proofreaders, typesetters, editors, journalists and reviewers may all have received galley proofs and advance copies. Watermarking would have allowed the author to trace a leak back to its source, and the original infringer could have faced civil (or even criminal) charges. At pre-release stage, where recipients receive copies in their professional capacity, this is a very strong deterrent. But back to the original question: is there a digital solution to ebook piracy? Sadly, there’s no silver bullet. Information can always be copied; an ebook can always be transcribed, even if it has to be done manually. It is important to realise, though, that it is not “us and them”, “good and bad”, “readers vs. pirates” – people obtain pirate copies of books because they choose an easier, cheaper route to get to something that they really want. They rationalise what they do, and are likely to have some moral self-licensing to support this. Really wanting to read an author’s work is not a bad thing! Make it easy for people to buy a copy, and to start reading as soon as they can. This is difficult to manage with physical print (as we saw with The President’s Keepers) but trivial with digital copies. Also, digital pirates are by definition comfortable with reading ebooks, so make it easy for them to rather find a legitimate copy. Pricing is important since less-than-honest readers are more likely to look for a pirate copy if they find the legal copy unaffordable. As a society, we have not really been able to re-invent bartering for the digital age yet, so price often boils down to “take it, leave it, or pirate it”. Always watermark copies of books with the identity of the recipient, whether it is during editing, sending out advance copies, or retail sales. A “digital bookplate” is one of the best ways to remind recipients that the license to read this copy extends just to them. 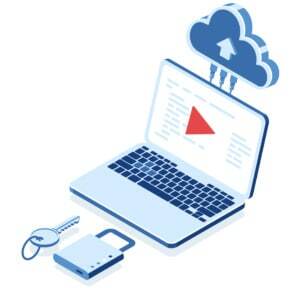 Digital rights management comes standard with many distribution platforms but is a two-edged sword. It may frustrate legitimate readers, without doing much to prevent piracy. If an ebook is available at a reasonable price, there is little excuse for piracy. Watermarking solutions make it much more frustrating to a would-be pirate to find a bootleg copy. If such an individual really wants to own it immediately, it should simply be easier to buy it. Alternatively, an individual who just wants to read it can always borrow a copy from a friend or a public library if they are willing to wait a bit. No, ebook piracy cannot be prevented. But good technology exists to help make people think twice about sharing an illegal copy or deciding to download rather than buy. 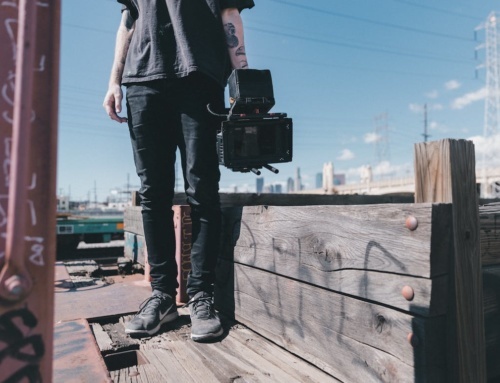 DISCLOSURE: The author is a founder and CEO of Custos Media Technologies, which provides efficient technology for watermarking media and tracing leaks. The author and the company are not affiliated to Jacques Pauw or NB Publishers in any way. Find out more about how Custos helps authors to protect sales of their ebooks.